This is a foreign exchange guide to Saint Pierre And Miquelon, the Euro currency plus EUR transfers and travel tips. A trip to the French islands of Saint-Pierre and Miquelon is a must for anyone planning travel in eastern Newfoundland. With a piece of Europe just 20 km from the province’s southern coast, why wouldn’t you plan an international trip? That being said, a visit to the archipelago does require some preparation. The islands of St-Pierre and Miquelon aren't just French-like with their berets, baguettes and Bordeaux, they are France, governed and financed by the tricolore. St-Pierre is the more populated and developed island, with most of its 5500 residents living in the town of St-Pierre. Miquelon is larger geographically but has only 600 residents overall. Jacques Cartier claimed the islands for France in 1536, after they were discovered by the Portuguese in 1520. At the end of the Seven Years' War in 1763, the islands were turned over to Britain, only to be given back to France in 1816. And French they've remained ever since. How to travel Saint Pierre and Miquelon? Air St-Pierre flies to St John's, Montréal and Halifax. There are two to three flights weekly to each city. Taxis to/from the airport cost around €5. From Fortune on Newfoundland, the St-Pierre Ferry makes the hour-long trip to and from the island once daily (twice on Wednesdays) in July and August. It runs less often the rest of the year. Departure times vary, so check the website. Boats carry foot passengers only, though plans are in the works for two car ferries. Much can be seen on foot. Roads are steep outside of town, so prepare to huff and puff. Car-rental agencies are resistant to renting to tourists, who admittedly have difficulty navigating the unsignposted, narrow, one-way streets. The visitor center rents bicycles (per day €13) and there are also motorized bicycles for rent. Local ferries head to Miquelon and Langlade; check with the visitor center for schedules and costs. 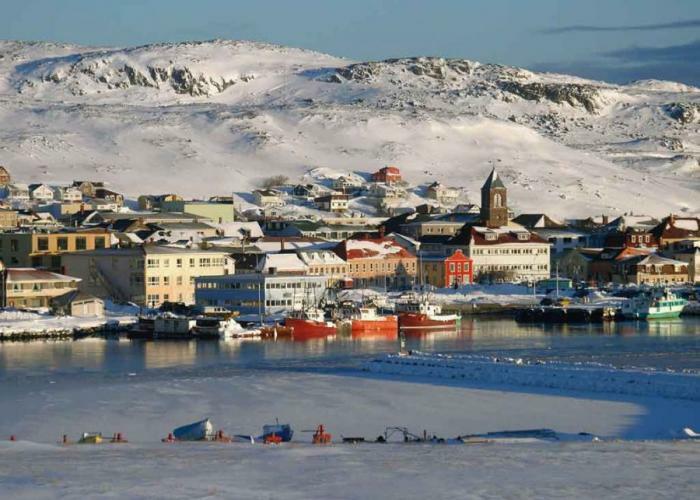 Travel tips for Saint Pierre and Miquelon. Just like in Europe, the winding narrow streets of Saint-Pierre are filled with vibrant shops and must-try restaurants – the key is finding them all! The town of Saint-Pierre isn’t zoned out like many cities in Canada, meaning that you may find the perfect souvenir in a tiny shop tucked among houses on a seemingly residential street. Saint-Pierre’s size makes it easy to explore by foot, so be sure to put on your walking shoes and meander down every possible street. The archipelago is a relatively small region that hosts a fair number of tourists each season. As a result, accommodations are limited, and it can even be a challenge to find supper during the height of summer, if you're not prepared! Plan your trip as far in advance as possible, and book accommodations, excursions, and dinner reservations as soon as you’ve decided on dates. Getting the logistics sorted out early means you'll be able to experience everything you want to, without worry. When searching around for information on how to get a good exchange rate when sending money to Saint Pierre And Miquelon you need to start with finding out the latest Euro foreign-transfer exchange rate. Once your funds are received by the provider the converted EUR amount will be transfered to the recipient account you specify in Saint Pierre And Miquelon.